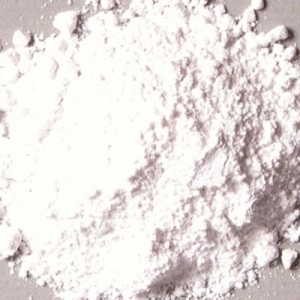 Details Titanium-Calcium White is a white pigment with high resistance to alkali that can replace titanium dioxide and lithopone in many applications. It is rutile titanium dioxide coated with precipitated calcium carbonate (PCC). Titanium dioxide and precipitated calcium carbonate are mixed together in an aqueous phase, which causes the titanium dioxide pigment particles to become coated with particles of precipitated calcium carbonate. Titanium dioxide pigment provides maximum whiteness and opacity in paint. It gives paint high hiding power, meaning the ability to mask or hide the substrate underneath. Today, titanium dioxide pigment is by far the most important material used by the paints industry for whiteness and opacity. These unique properties are derived from the refractive index of titanium dioxide. The refractive index expresses the ability to bend and scatter light. Titanium dioxide has the highest refractive index of any material known to man, greater even than diamond. To take advantage of this property, titanium dioxide must be mined, refined and ground to a fine, uniform particle size. Titanium dioxide white pigments are developments of the 20th century, and because of their high hiding power, low toxicity and reasonable cost, they have eclipsed other traditional white pigments. Titanium dioxide absorbs a low amount of oil. The oil absorption ratio is 15�20 parts by weight of oil to 100 parts by weight of pigment. If the measurement were grams, it would require 15 to 20 grams (by weight) of linseed oil to grind 100 grams (by weight) of pigment to form a stiff paste. It makes an average drying oil paint that forms a soft, brittle film.